Olympic torch carried on royal barge Jump to media player The Olympic Torch has been transported on the Royal Barge on the final day of the relay as it makes its way through London to the Olympic Stadium. Royal send-off for 2012 torch relay Jump to media player Thousands of people have filled the streets of London as the Olympic torch relay travelled the capital ahead of Friday's Opening Ceremony. 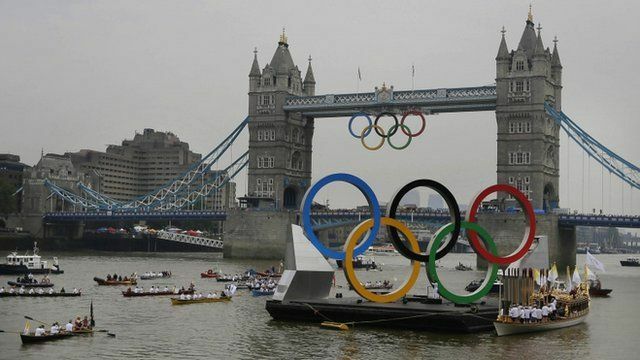 The Olympic Torch has been transported on the royal barge down the River Thames, on the final day of the relay. The £1m royal barge, which led the river pageant during the Diamond Jubilee in June, was rowed by 16 crew, who were chosen from a squad of 28 on-board rowers on the day. 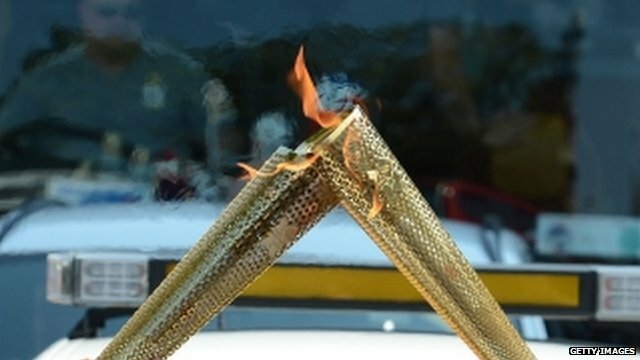 Later the Olympic flame arrived at City Hall where the last torchbearer was Amber Charles. Tim Muffett reports from the bank of the Thames, and Jane Hill reports from next to Tower Bridge.